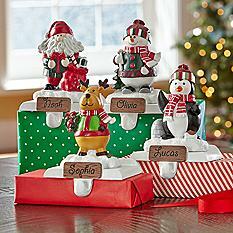 Your mantel has never been more cheerful than when you decorate it with these adorable Winter Wonderland Stocking Holders exclusively from Personal Creations. With 8 characters to choose from, you can order something unique for each member of your family. Choose from Santa, Mrs. Claus, penguin, moose, snowman, black bear, dog or cat, and personalize with any name or nickname that includes up to 9 characters and ensure that your family members always get the right stocking. Each magnetic name plaque is removable so you can use them throughout the rest of the year as well. Created from high quality resin, these cheerful stocking holders are designed to be a treasured addition to your holiday traditions for years to come. Love these! Unfortunately, we ended up adopting our foster baby and needed a new name plaque (changed his name) and they don’t sell replacements for that, and these are sold out. Hi Kari, sorry they were sold out – wishing you the very best this Christmas season. Yes! We had a new birth and need a new one… can’t find this or anything similar anywhere!